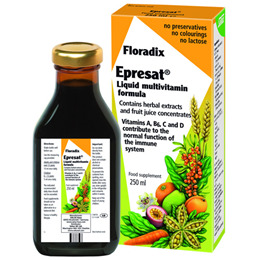 Floradix Epresat Multivitamin is a delicious food supplement providing vital vitamins A, B6, C and D for a normal function of the immune system. Vitamins B1, B2, B6, C and niacin contribute to normal metabolism. Vitamins B1, B6, C and niacin which may contribute to normal brain functions. Vitamin E which may contribute to cell protection against oxidative stress. Floradix Epresat liquid is easy to take and helps safeguard the balance of vitamins A, D, E, C, B1, B2, niacin and B6. As these nutrients are already dissolved, they are absorbed more quickly by the digestive system compared to tablets. 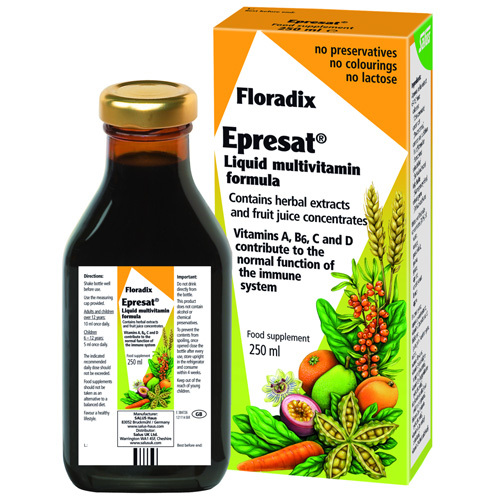 Floraidx Epresat contains several fruit juice concentrates and selected herbs for a pleasant fruity taste. Cola seed (Cola acuminate), carrot root (Daucus carota), common sea buckthorn fruit (Hippophae rhamnoides), spinach leaf (Spinacia oleracea), kelp thallus (Macrocystis pyrifera), wheat germ (Triticum aestivum). Water, orange, passion fruit, guava, grape, apricot, carob extract, lemon, apple. Fructose syrup, aqueous yeast extract, vitamin C (ascorbic acid), thickener: guar gum / xanthan gum, niacin, natural flavours, vitamin E (as d-alphatocopheryl acetate), vitamin B6 (as pyridoxine hydrochloride), riboflavin (as riboflavin sodium phosphate), thiamin (as thiamine hydrochloride), vitamin A (as retinyl palmitate), vitamin D (cholecalciferol). Adults and children over 12 years: Take 10ml once daily. Children aged 3 - 12 years: Take 5ml once daily. The indicated recommended daily dosage should not be exceeded. Food supplements should not be taken as an alternative to a balanced diet. Below are reviews of Floradix Epresat Liquid Multivitamin Formula - 250ml by bodykind customers. If you have tried this product we'd love to hear what you think so please leave a review. Floradix Epresat Multivitamin is a delicious food supplement providing vital vitamins A, B6, C and D for a normal function of the immune system. Vitamins B1, B2, B6, C and niacin contribute to normal energy-yielding metabolism.